Messenger of the Gods. You feel like they already offered the same notebook? You are completely right. Still, the brand-new X2300 video card of ATI, the harbinger of the long expected new video card generation, induced us to look closer at the A8JR once more. As already mentioned the case of the Asus A8JR is the same than those of the already reviewed Asus A8JP. We could not detect any differences regarding workmanship and materials, therefore this review is equivalent to the one of the A8JP regarding this matter. Two colors form the appearance of the A8JR: Black and silver. E.g., there is a silver cover at the black base unit and the display with black border is also protected by a silver cover at its back side. The forms are designed typical Asus, in a geometric style. These are flat surfaces, clear lines and sharp edges, which seem compared to those of Apple nearly roundly dressed. 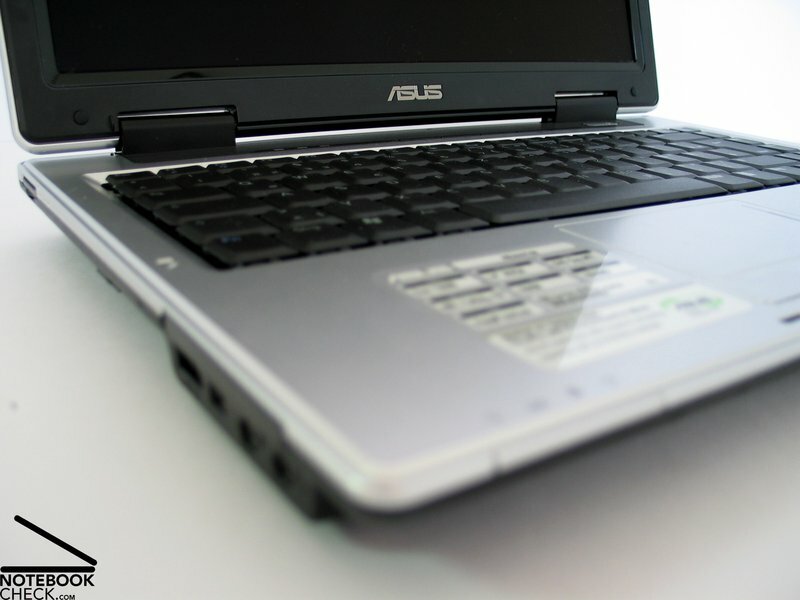 Similar to other Asus notebooks the design supports a slim and light look-and-feel by a at the lateral surfaces tapered case. The workmanship of the Asus A8JR is rather good. We could not detect any of the typical weaknesses like uneven gaps or creaking noises during handling this notebook. Regarding deflection resistance, we have to mention, that the display cover can be clearly pushed in without applying much force. 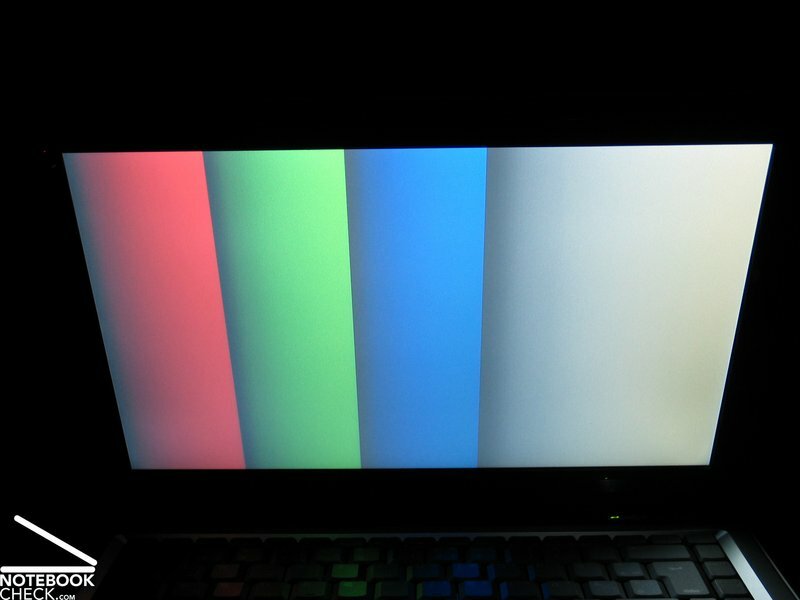 Working with this notebook is basically unaffected by this fact, but, you should take care during transportations. A similar phenomenon can be observed at this notebook's bottom side. Especially at the region of the vent holes the case slightly yields under pressure. However, the electronic inner parts should yet be secure. Regarding flexural rigidity the case is very robust. 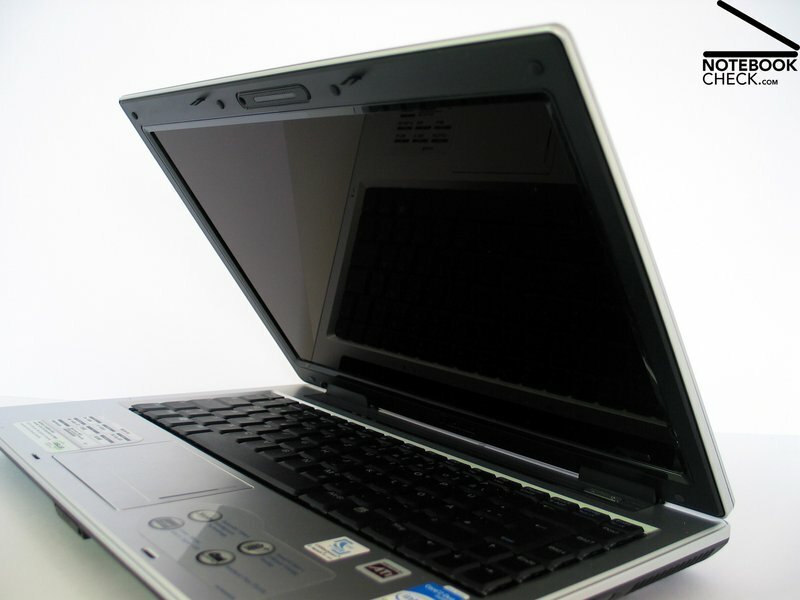 You can pick it up without problems at any edges and corners without unreasonable torsions or creaking noises, which is an important facet for a mobile 14 inch notebook. On the one hand the display hinges are of adequate size, however, its plastic cover can be moved a little bit and does, therefore, not really appear robust. Furthermore, there is a slight see-saw by adjusting the display's inclination. The Asus A8JR's display comes with two metal parts, which gets caught in the base unit upon closing, quasi a reverse ramshorn hook system. Especially, if closed the display slightly wobbles at the corners. The ports are partly placed at the left, the right and the back side. 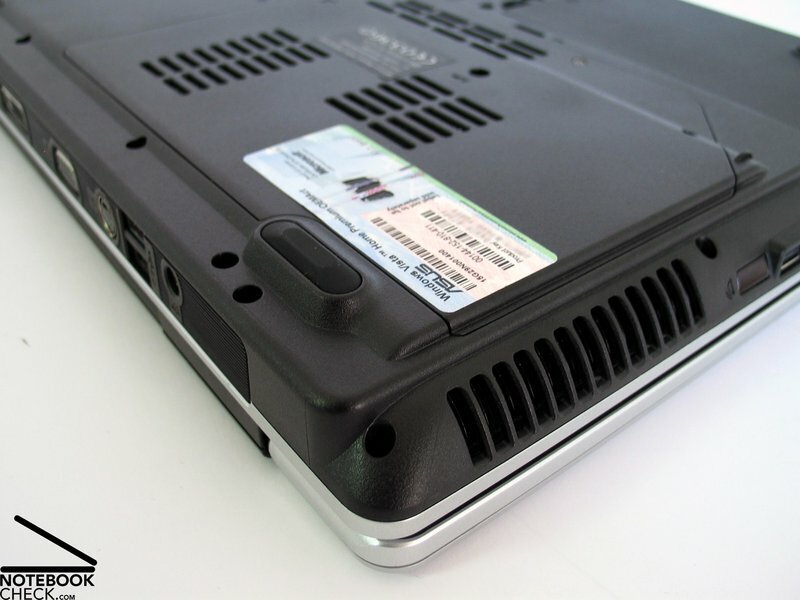 Ports, which are likely to be permanently in use, are thereby reasonably placed at the back side. 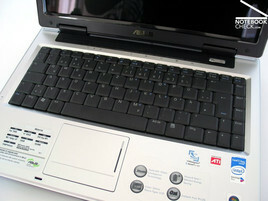 Alike the case, also the keyboard of the A8JR is the same part than used in the A8JP models. The keyboard is fitted in a rectangular form without any apparent structuring or depositions. Surprisingly enough, it was still possible to size nearly all keys reasonably. E.g., the enter key extends over two rows and the space bar is especially spacious. 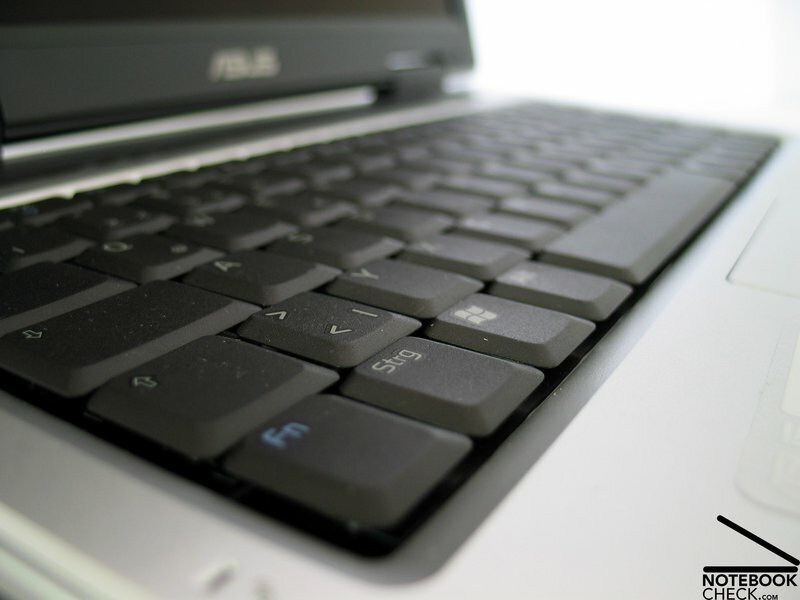 Keys like Alt and Ctrl at the left of the keyboard are of standard size, and the size of the Cursor keys were downsized to three quarters of normal size. Also the F-keys are of smaller width and the height was cut to about half of normal size. Typing with this keyboard is in general comfortable. The keys provide possibly slightly more resistance than those of comparably keyboards. The noise emissions during typing do not annoy in any way, because you can't hear any disturbing clatter or so. The additional keys are typical Asus very narrow, and cannot be recognized at the first glance as such. You can use them to change the performance settings, or activate Bluetooth and WLAN. The notebook's touch pad requires some remarks: First of all its form looks good and the color fits well to the case. Furthermore, it does not have separate touch pad buttons. They are integrated in the same face, seamlessly coalesced with the pad. The surface has the same coat than the surrounding case. Despite of optical advantages, this solution has some disadvantages in use. E.g., the surface is rather uneven and the floating properties are not so good. 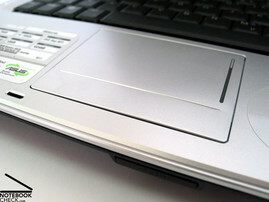 In comparison with the hand ball support, this would be the better touch pad surface. Both touch pad buttons react best at their lower outer edges. In between there is a relatively big dead zone, which does not react to clicks. In contrary to the A8Jp, the A8JR is equipped with a 1280x800 WXGA panel. 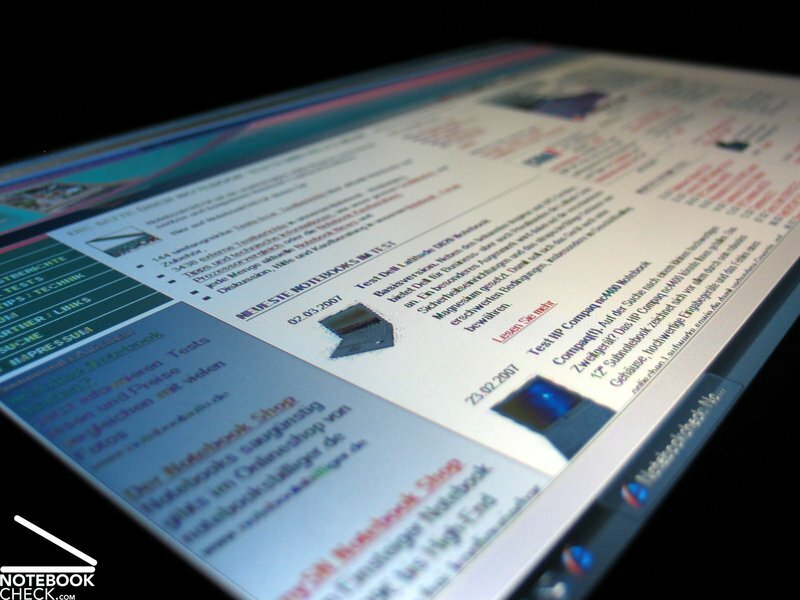 However, the measurements to not uncover much difference between this display and the 1440x900 pixel display. E.g, the maximum brightness was very good at 188.9 cd/m² and the illumination good at 77.7 %. 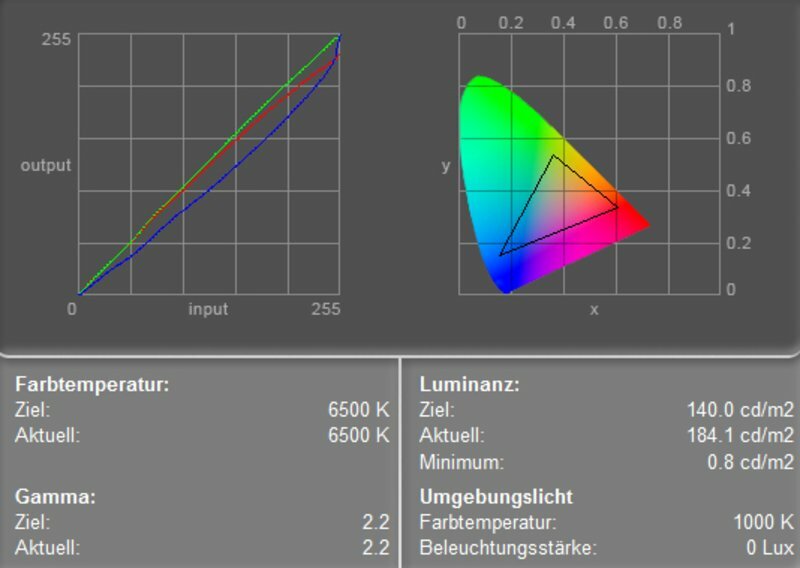 The measurement diagram depicts nearly ideal green and red color curves and the usual deviation of the blue color curve. Therefore, the colors appear to be warmer. 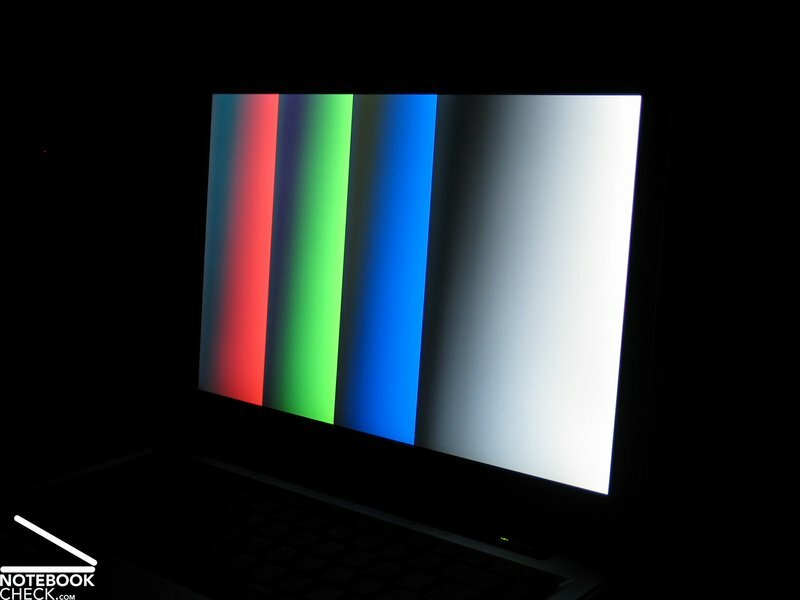 The black value of the display, i.e. 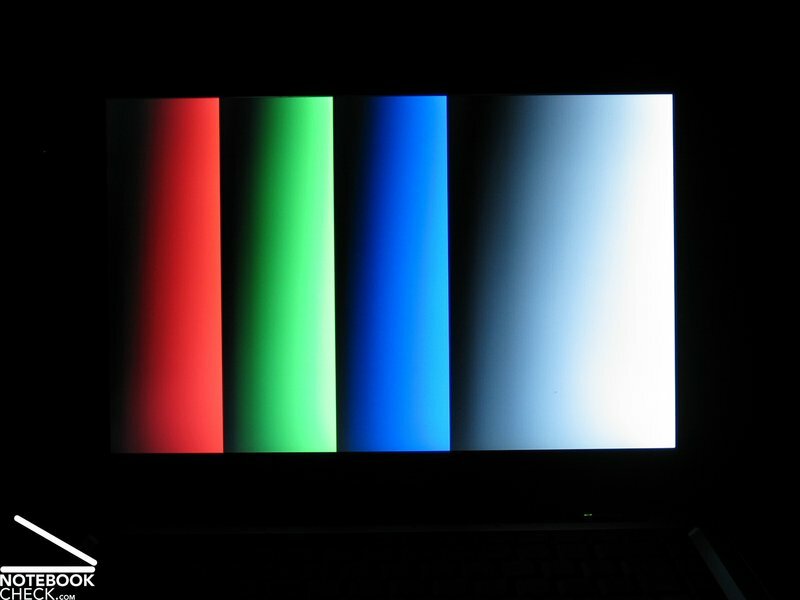 the minimum brightness was measured at 0.8 cd/m². This leads to a maximum calculated contrast of 236:1, this is nearly identical to the contrast ratio of the 1440x900 panel. The outdoors use of the notebook is very limited by its heavily reflecting display. Depending on the brightness of the environment, the contents can be either read to some extend, or get completely illegible cause of reflexions. Regarding the stability to the vantage point you can vertically observe the usual darkening or whitening outside an adequate operation area and horizontally the usual reflections. 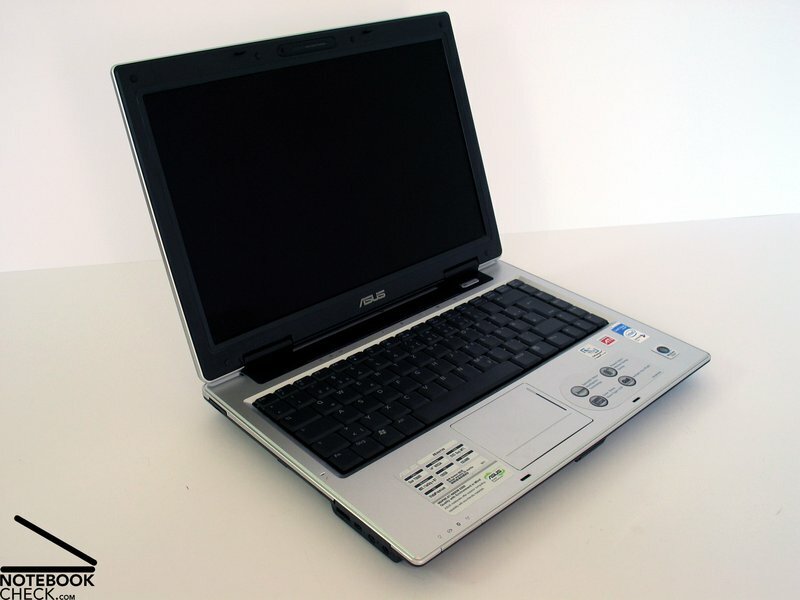 For the purpose of comparability of the benchmark results, we first of all need to mention that the Asus A8JR comes with a pre-installed Windows Vista operating system. Therefore, direct comparisons to XP models have to be taken with a pinch of salt. 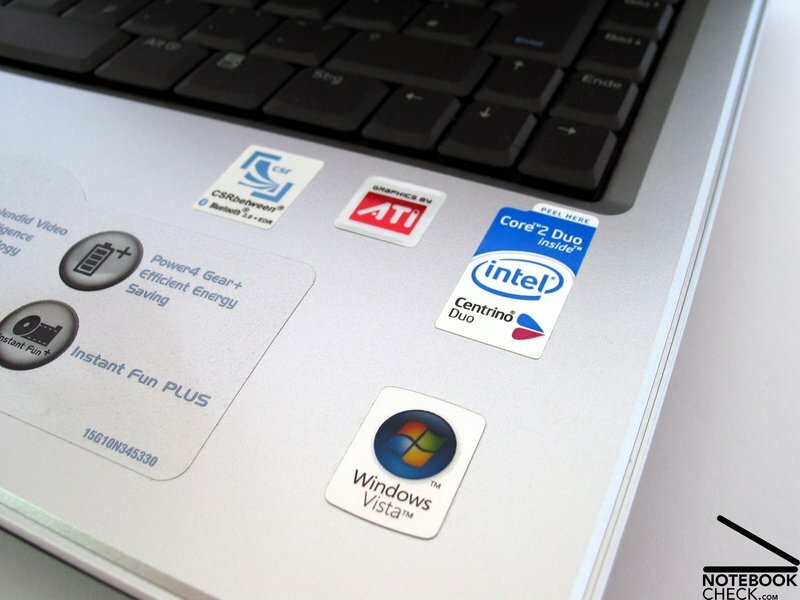 The notebook is equipped with a Core 2 Duo CPU by Intel. The T5500 is sufficiently powerful for all conventional applications. The total of 1024 Megabyte (2x512MB) memory should also be adequate today. For a further upgrade you should consider that you have to remove at least one of the 512MB chips and replace it by another memory chip. Because of compatibility problems with Windows Vista, it was not possible to execute the PCMark benchmark. Highlight of the Asus A8JR is surely the ATI Mobility Radeon X2300 video card, a harbinger of a new video card generation, which supports DirectX 10.0. 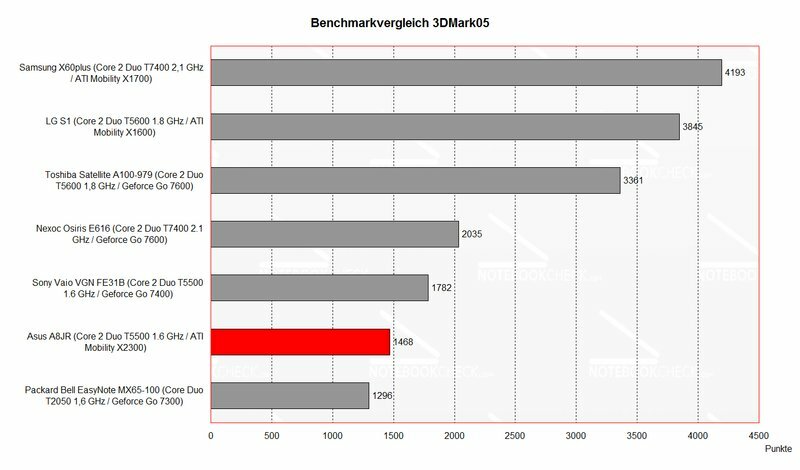 The benchmark results of the X2300 uncovers that it approximately reaches the grade of a Geforce 7300 and is a little worse than the 7400. So, it should be possible to play older games without demanding 3D graphics with the ATI Mobility Radeon X2300 video card without problems. It should even be possible to play current games to some degree by reducing the resolution and the number of details. A test with the current real time strategy game "Supreme Commander" (1024x768, low Details) resulted in an average of 15-30fps, an acceptable (cause playable) result. The 120GB Seagate Momentus hard disk reached very good results. The access time as well as the transfer rates are both above-average and nearly reach the level of comparable 7200 revs models. Similar to the A8Jp model, the fan starts running soon, and emits a clearly perceptible noise. You cannot even avoid this without load and by activating the energy save profile. Under load the fan turns up and reaches a maximum loudness of 39.8 dB. Although the maximum loudness is not really disturbing, a low noise level which gets apparent especially in silent environments, is always present. Regarding surface temperatures it's different. 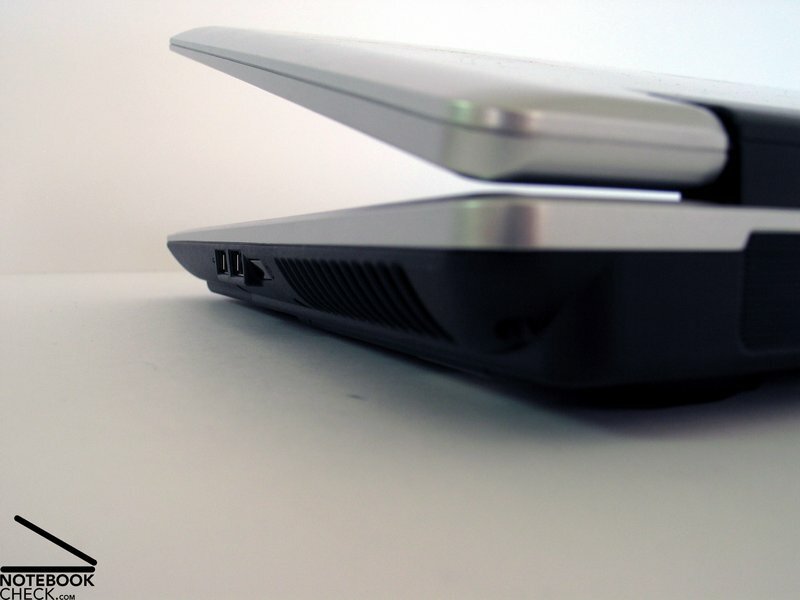 At the top side as well as at the bottom side of the Asus A8JR you can hardly observe any noticeable warming. This notebook has two speakers, which are placed at the front side and emit their sound toward the desk. An overmodulation of the speaker at maximum volume and the nearly always missing basses got apparent. The runtime of the Asus A8JR can be no means be called long. The measured runtime is in between 74 minutes and up to a maximum of 2.5h. 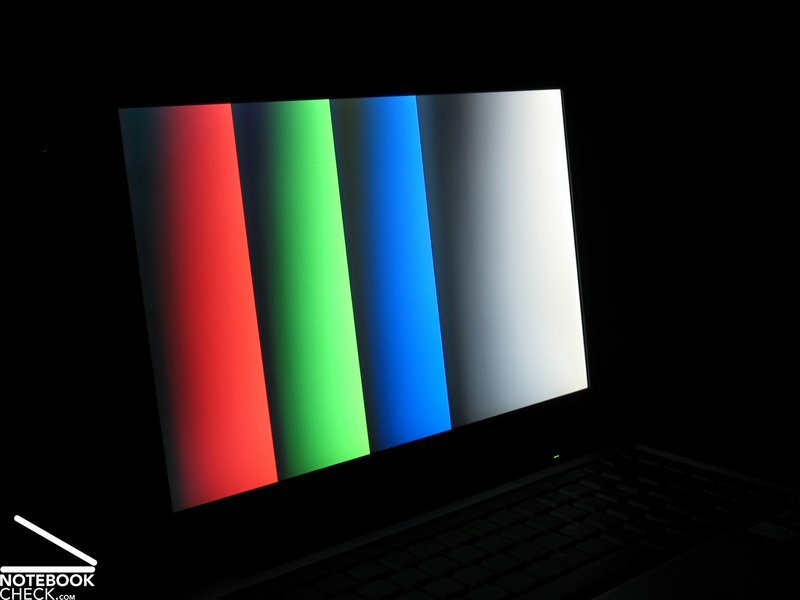 Besides, in practice, it is not realistic to reach the maximum runtime, because it's rather cumbersome to work with minimum display brightness. However, it seems to be possible to reach a runtime of about 2h by optimizing the energy settings. 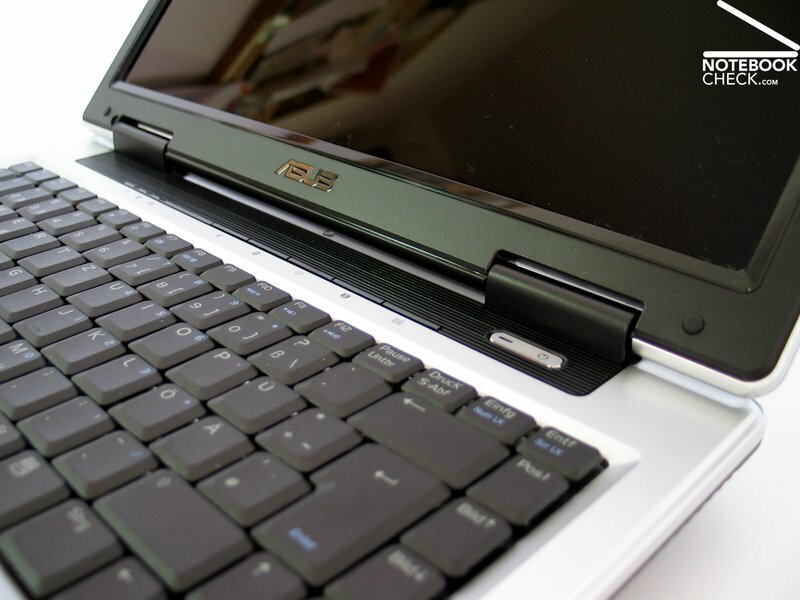 The Asus A8JR is by all means an interesting solution between a 12" subnotebook and a 15,4" multimedia notebook. The robust case is of good workmanship and allows a mobile use. However, there are some weaknesses regarding pressure resistance. The keyboard seems to be somewhat dense and misses out a clear structure. Typing feels comfortable and is rather quiet. 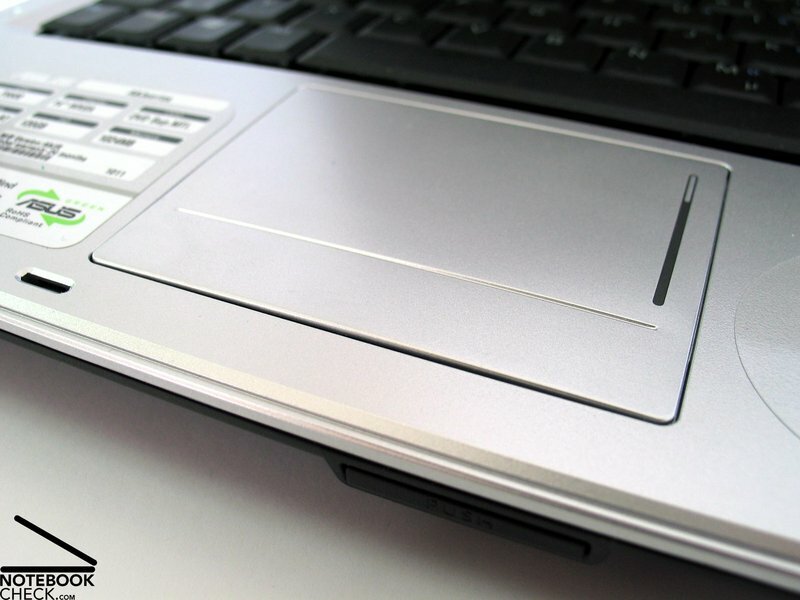 The touch pad can not be recommended, because of its sticky surface and also because of its hard to push buttons. The Display convinced by excellent brightness and good illumination. However, it heavily reflects, therefore, it is to be used in ideal lightening conditions. 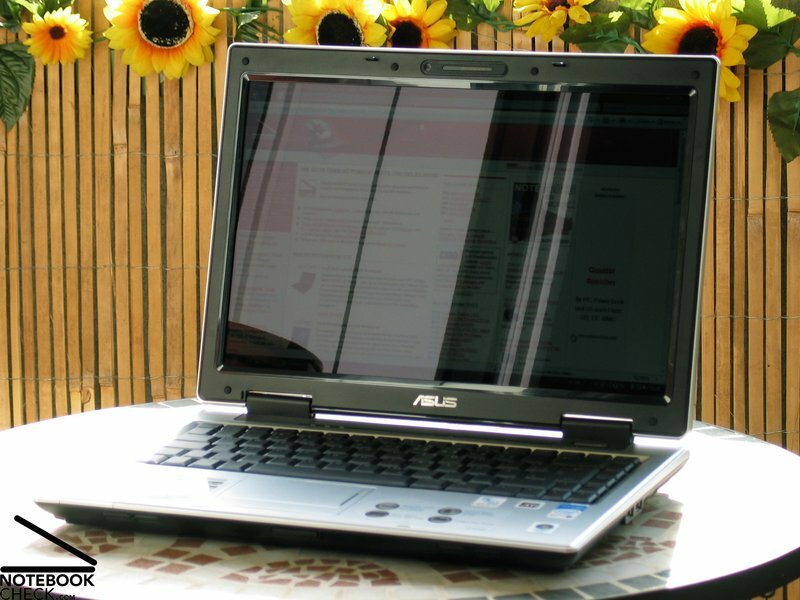 The performance of the Asus A8JR is passable, considering it is a 14 inch notebook. The brand new X2300 video card by ATI is about as good as a Geforce 7300/7400 and therefore rather an office than a game solution. The noise emissions are a weakness of the A8J series. Even without load the noise of the fan is steadily present. Quite the contrary, the surface temperatures are alright. The 4800 mAh battery, which is already the bigger solution than the 3200 mAh standard battery, cannot not convince by runtime. In practice you can assume a maximum runtime of about 2h during office operation. There were no anomalies regarding the A8JR's surface temperatures. The fan could be heard even without load. In total the notebook is sufficiently powerful for daily needs. 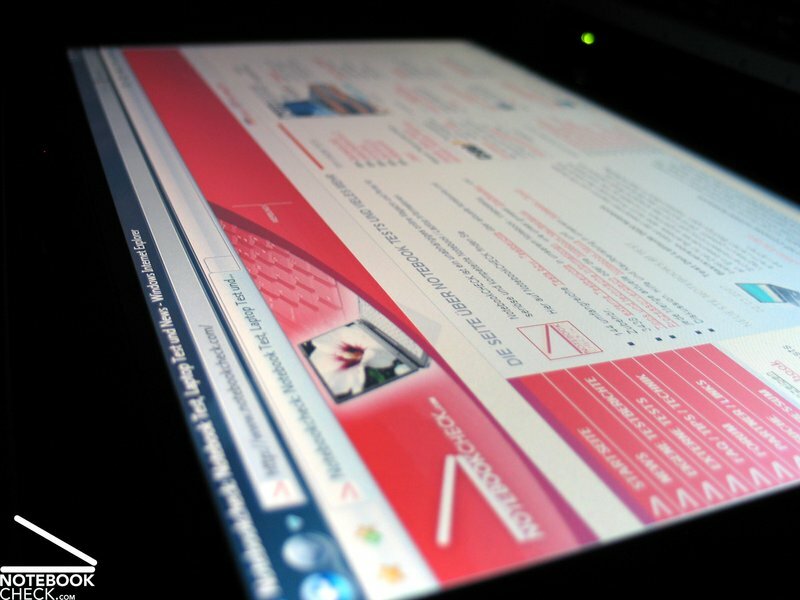 This is the first time, we could review the performance of the ATI X2300 video card. 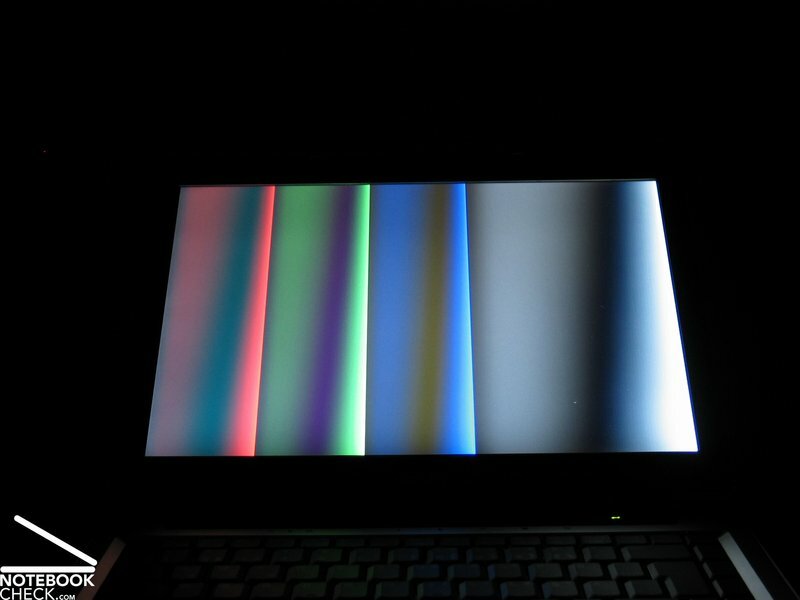 The display's brightness and illumination are good, however, it reflects heavily. Not so the touch pad - The uneven surface requires completely dry fingers. The keyboard is dense, but yet comfortable in use. 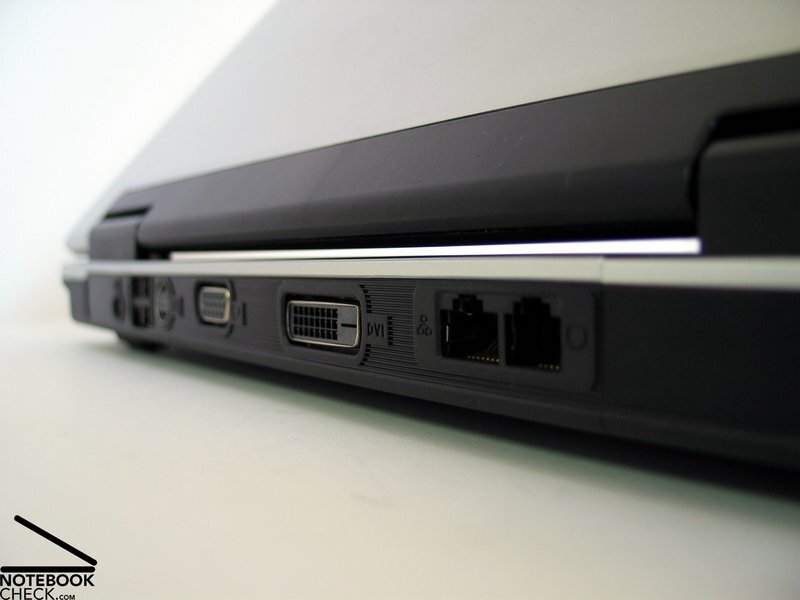 Most of the comprehensive number of interfaces are placed at the back side. ...especially of the display cover. ...in solid design and of good workmanship. 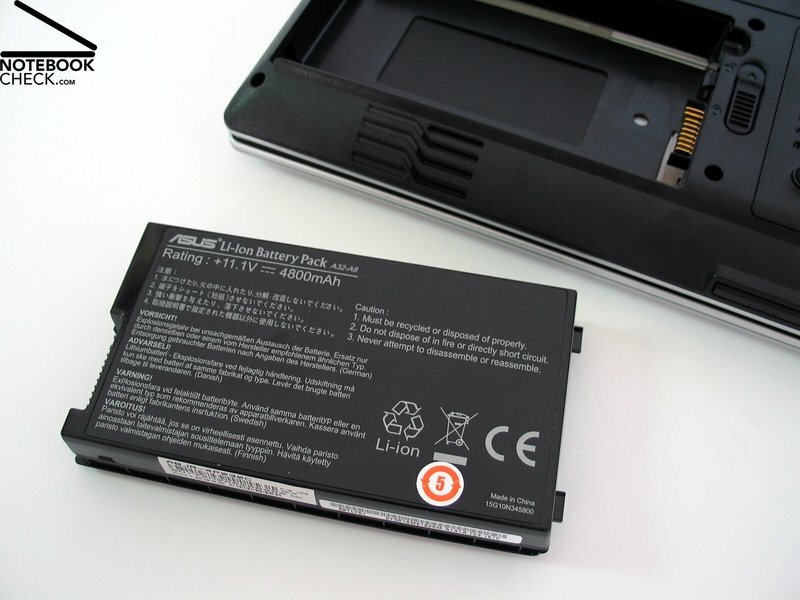 The 4800 mAh battery has a runtime of 2 hours at low demands.